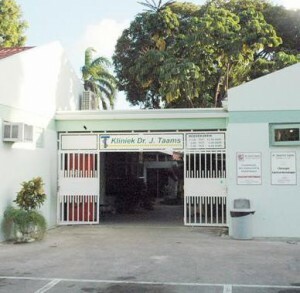 WILLEMSTAD – As we have reported before, the situation at Taams Clinic is not well. Now the banks have stopped all financial activities with the clinic. This means that the private clinic cannot purchase medical materials and products anymore. The result of this is that the clinic cannot accept more patients. According to the medical director, Dr. Earl Esseboom it is a matter of days before the plug is pulled now. The clinic is only open for day care. About 185 people fear for their jobs. Suppliers and banks have supported the Taams Clinic for a long time. But in the meantime, there have been several seizures. Because of this, there is a lack of certain drugs and materials that are necessary in order to perform various operations. Esseboom states that the clinic has to close its doors unless help comes from the government.